This meatball soup recipe may look intimidating by the list of ingredients but it is actually really easy. Just think of it as being broken down by the meatballs, veggies and soup. The soup is delicious by itself but much more flavorful with the meatballs and veggies. See below for the details on how to put everything together in the following easy step by step instructions. 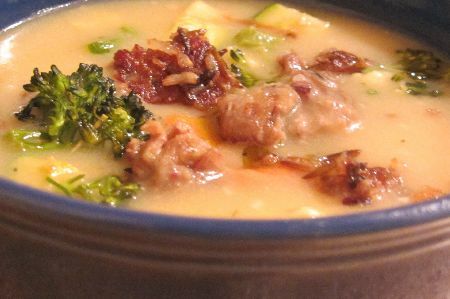 Before you know it you will be enjoying this delicious soup recipe! Start by cooking the wild rice or make it the day before. Follow package directions to cook wild rice (approx. ½ cup rice to 1 cup water) take approx 50-60 mins to cook. I had wild rice the night before and use the left over (1/2 cup) in the meatballs for this recipe. If you have leftover quinoa or other type of rice you can use that instead of the wild rice. Once the rice is cooked mix together the ground turkey meat, five spice powder and minced onion, add in rice and form into little meatballs (about ½ in size), place into frying pan with a tbl olive oil. While the meatballs are cooking cut the vegetables. Dice the parsnips, carrots, zucchini, and chop the cauliflower. I use most of the broccolini, only cutting off the tips at the end of the stock and dicing the rest and leaving the florets whole. To cut the lemongrass: Cut off lower bulb and remove tough outer leaves. Inside you will find the main stock which is yellow. I like to dice and through into a food processor. Place veggies in a baking dish, drizzle with olive oil, rosemary, ginger and blended lemon grass. Toss and place into the oven at 400 for 30-40 mins. We are almost done. In a large saucepan (large enough for soup, veggies and meatballs) add ¼ cup of olive oil, place on medium heat for a minute then using a whisk mix slowly mix in 1/4 cup Rice Flour, when the flour is completely mixed in slowly add in a 1/4 cup of rice milk. Note: You are making a roux similar to a white sauce, the mix should form into a dough before you add more liquid. If the roux does not form with the 1/4 cup of milk, slowly add in an additional tbl of milk until it does. Once the roux forms slowly pour in the remaining Rice Milk (total 2 cups). Once the milk is mixed in add pinch of salt,1/4 tsp minced onion, ½ tsp Basil, ground mustard, ¼ tsp celery salt. Let simmer for 5 mins then add in 5 cups of chicken stock. Mix together ¼ tapioca flour with 3 cups of water and pour into the soup to thicken a little, continue to stir until dissolved. Stir occasionally for 5 -10 mins on medium high heat, mixture should thicken a little. Mix in cooked meatballs and veggies into the soup and serve this meatball soup warm. 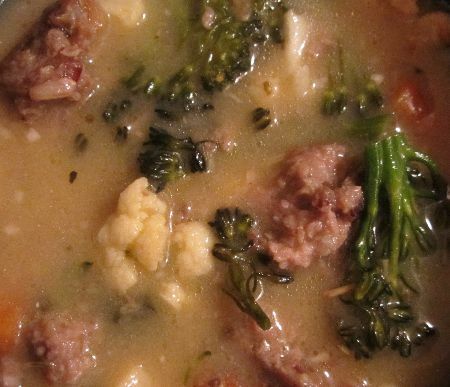 Return From Meatball Soup Recipe to Food Allergies Home Page!Want More Soup Recipes, Click Here!